The Patel family behind Mirch Masala- from left to right: Vatsal, Dhara, Vandana, Navnit, Neel, and Delisha Patel. The corner of 3rd Avenue North and North 19th Street in Billings warms with spice and flavor. On the outskirts of downtown, Mirch Masala, an Indian restaurant opened by the Patels in the fall, serves up homestyle vegetarian food. 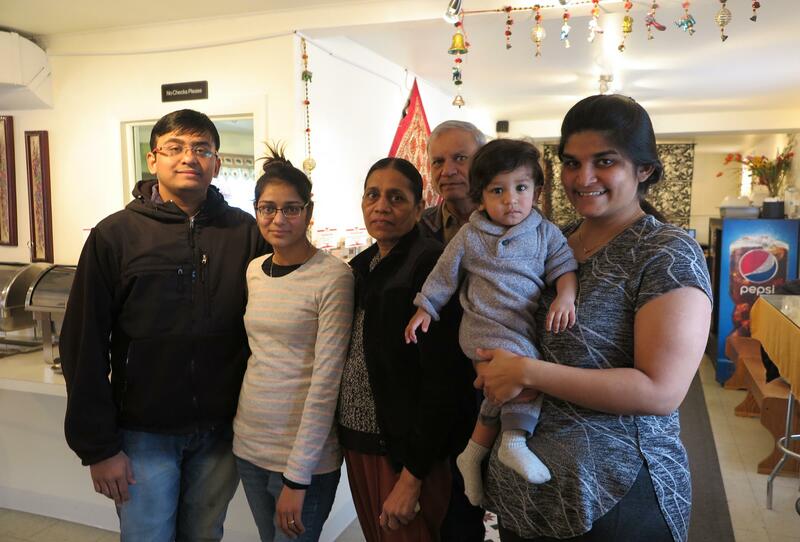 With mother and chef Vandana, patriarch Navnit, son Nick and his wife Delisha with grandson, Neel, and daughter Dhara and husband Vatsal, they illustrate what can be cooked up with the power and energy of family. 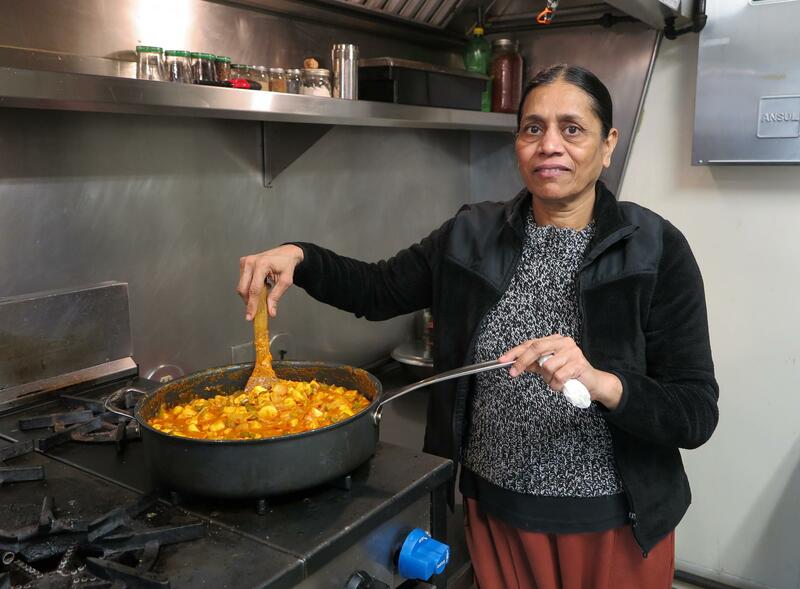 Taking over the old Mamacita’s space, Delisha said, “It feels like India in this little tiny place.” Though seating accommodates up to nearly two dozen diners, the food expands any perception of small. 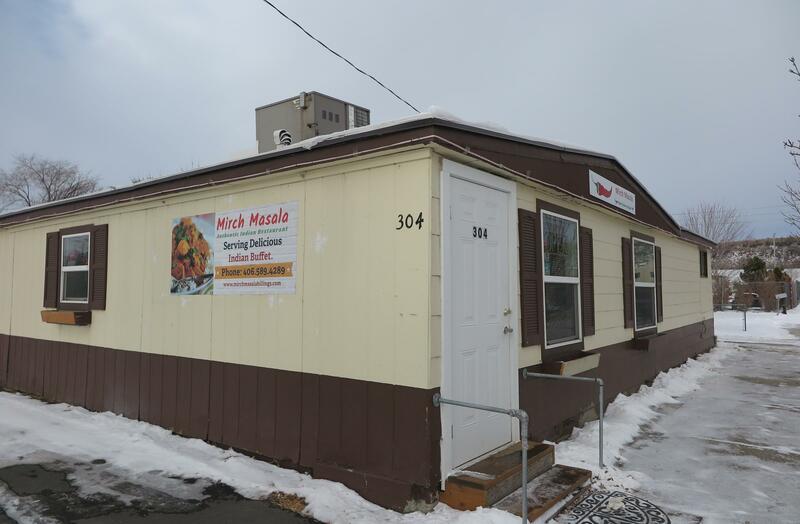 Mirch Masala located at the corner of 3rd Avenue North and North 19th Street in Billings. Delisha and Nick met as students at Montana State University Bozeman. As students they missed the flavors of India. Then when Vandana arrived in Bozeman in 2010, they convinced her to share the delicious food she cooked. Though Delisha thought this might not have been the best business idea, the restaurant provided Chef Vandana an opportunity to expose Montana to Indian flavors. Chef Vandana in the kitchen of Mirch Masala with just cooked Paneer Chili. When asked what Vandana’s favorite dish was to cook, she immediately responded, “Cashew Korma.” Delisha explained, “Its her (Vandana’s) husband’s favorite recipe and every time there is a special event in the family whether it is your birthday or anniversary, cashew korma has to be on the menu for sure.” Cashew Korma is a rich spiced cashew, tomato and onion curry with whole cashews and served at dinner time only. At the restaurant, Mirch Masala has a daily lunch buffet from different regions of India. Delisha said, “We are more into what the every day meal is in every day homes in India which why homestyle cooking.” Their lunch buffet offers foods from mostly the northern and western areas of India. Choices include curries, slow simmered lentils or dahl, appetizers such as samosas or turnovers stuffed with roasted potatoes and pakoras or chickpea flour fritters accompanied with basmati rice, raita or a yogurt based condiment, and chutneys completed with desserts such as mango mousse. In the evenings the variety of offering is presented in a thali format or on metal trays with selections served in bowls. Dhara Patel stands at the buffet line in front of dessert choices of mousse and Gulab Jumun. Dhara oversees the dessert preparation at Mirch Masala. Though mango mousse, made with Alphanso Mangoes and cream, is her staple at the restaurant, she mixes things up and adds different fruits and flavors to the mousse. Gulab Jumun, a sweet milk based fried dumpling, is another sweet ending. In clarifying the style of cuisines in India, I recruited the expertise of Raghavan Iyer, James Beard and International Association of Culinary Professionals cookbook award winner. His books Indian Cooking Unfolded, 660 Curries, Asian Flavors and Turmeric Trail document years of research and share recipes from his homeland. When attending college in the states, he learned to cook for himself. These days he is embarking on opening a new eatery called Pizza Karma utilizing a tandoor to cook naan that forms the base for topping with global food and flavors. Acccording to Iyer, the cuisine of India can be viewed as two regions of north and south. He did point out that this is a very simplistic view for the food of India is far more complex. In jest he said how difficult it would be to summarize American food in a few sentences. Some of the choices on the lunch buffet line. For Billings what is newly available is the bold and vibrant food found at Mirch Masala. At the end of a paved road in Pray just outside Livingston is the iconic Chico Hot Springs Resort and Spa. On this day as fall was edging into winter, my husband and I drove a hundred miles as in the Montana way to dine in the recently opened Tasting Room. As we stepped out of our car under the watch of Emigrant Peak, we thought of times past at Chico with each other, friends and family. The clapboard Victorian lodge with green framed windows welcomed us as it did twenty years ago when we first visited. In November Bistro Enzo in Billings celebrates twenty years in business. Executive Chef and owner James Honaker claimed the actual date was November 11, 2018 or sometime thereabouts. He seemed almost nonchalant about the birthday. For long time staff - servers Daisy Castro and Dave Caserio, day Chef Paul Reitz and volunteer Lezlie Solari, the time marked event held significance.